So who is Michael Gazzaniga? 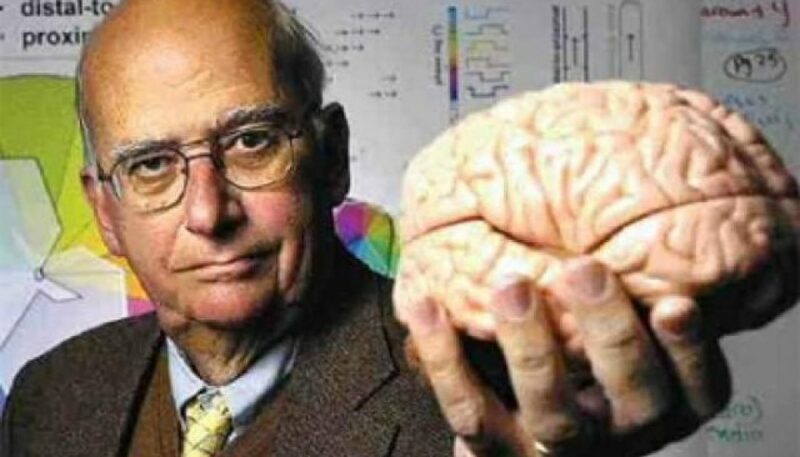 More than fifty years ago, Michael Gazzaniga set out on a discovery that underlies all of contemporary neuroscience: that the right- and left hemispheres of the brain can act independently from one another and have different strengths. As a result of the foundational nature of his work on split-brain patients, i.e., people who have had the two halves of the brain separated to relieve severe epileptic seizures—he is is often referred to as the father of cognitive neuroscience. His writing is renowned for its wit and accessibility, as well as its scientific elegance, and has inspired some of the most important minds in the field including Steven Pinker, Oliver Sacks, and V.S. Ramachandran. Today Dr. Michael Gazzaniga is the Director of the SAGE Center for the Study of Mind at the University of California, Santa Barbara, president of the Cognitive Neuroscience Institute, and author of books including Tales from Both Sides of the Brain: A Life in Neuroscience. Together with his mentor Roger Sperry, Gazzaniga studied so-called split-brain patients, i.e., people who have had the two halves of the brain separated to relieve severe epileptic seizures. The separation is effected through surgery known as a corpus callosotomy, the severing of a large part of the corpus callosum, or the broad band of nerve fibers that join the two hemispheres of the brain. When Gazzaniga started his research in the 1960s, corpus callosotomy was just about the only way people with severe epilepsy could find relief. The surgery was never done widely, and is today used only in extreme cases that do not respond to medications that have been developed in the intervening decades. Accordingly, most of the split-brain research derives from fewer than 20 patients, of which the first ten participated in Gazzaniga’s five-decade-long longitudinal study, which still continues today with the handful of surviving patients. Dr. Charles L. Branch (left) presents the Charles L. Branch BrainHealth Award to Dr. Michael Gazzaniga. Before I let Gazzaniga himself explain his findings in a video interview with Alan Alda, here is a refresher of high school biology and some info about Gazzaniga’s methodology that will help you follow the astounding demonstrations of left- and right brain functions in the video. Most of us don’t need a reminder that the brain’s right hemisphere controls the muscles on the left side of the body, while the left hemisphere controls the muscles on the right. When you wink your right eye, for example, that’s the left side of your brain at work. Our right and left hemispheres control the muscles on the ‘opposite’ side of our bodies. Unlike our muscles, each of our eyes gets messages from BOTH sides of the brain when it comes to vision. The diagram below explains how this works. (If the image is too small for you to see the detail, click here to go to the source.) At the bottom of the diagram, the shaded area represents the visual cortex—here you can see that it straddles both hemispheres. Now look at the “red” nerve fibers: they connect the right eye to the right visual cortex to AND the left eye to the left visual cortex. Accordingly, visual information from BOTH eyes reaches the visual cortex, each from the hemisphere on the same side as the eye. Now check out the “blue” fibers: you’ll note that they cross over at the optic chiasma, so that visual information from the left eye goes to the right hemisphere part of the visual cortex, and visual information from the right eye goes to the left hemisphere part of the visual cortex. In this way, each eye gets information from the opposite hemisphere as well. The fact that our eyes each sends visual information to BOTH hemispheres is known as binocular vision: since each eye receives a slightly different image than the other, we have depth perception, that is, we are able to judge the relative distances to objects in our visual field. The visual field is the entire area that can be seen when the eyes are directed forward focused on a mark in the center of a screen, shown in the diagram below as the point at which the red and blue lines on the left of the diagram meet. Because of the optic chiasma, the information coming into each eye from its visual field goes to each of the two hemispheres. One more piece of info you need to enjoy the video to its fullest: Gazzaniga’s methodology consists of asking participants—who are, in addition to split-brain patients, also college students or retired adults—to look at the center of the screen. They then display words (or pictures, or other types of stimuli) fairly rapidly – so people can’t move their eyes fast enough to fixate them directly – to the left or the right side of a computer screen. By comparing how people respond (for example, whether they can accurately remember a word) when it was processed first by the left hemisphere versus by the right hemisphere, they can test ideas about what each hemisphere is capable of and whether one hemisphere has better, or different, abilities compared to the other. Now for your treat after concentrating so hard for a few minutes! Here is the video. –Dr. Michael Gazzaniga, Director of the SAGE Center for the Study of Mind at the University of California, Santa Barbara, and author of Tales from Both Sides of the Brain: A Life in Neuroscience. Dementia Vacation	Blessed be the caregivers of us the elderly, particularly us dementers! Wow. Michael Gazzaniga is a very big deal, indeed. Many congratulations! How lovely to hear from you, Janiece. I am also so thrilled to hear from someone who did not have to read my blog to know who Michael Gazzaniga is! I have read several of his books over the years and wrote quite a bit about his work in my book too. I hope you are doing marvelously. It is still such a thrill to me that you were willing to participate in the VideoWest film. Thanks for that, and your support in so many other ways over the years.